Philip Meyer took a series of photographs showing residents of the Blue River Valley as they prepared to move from their homes and farms as part of the Tuttle Creek reservoir and dam relocation project in Pottawatomie County, Kansas. He captioned this photograph "a valley prayer asks for divine guidance 'in these days when the continued existence of our place of worship, our homes and this valley are threatened.'" This is probably Mahridal Lutheran Church, organized in 1863. 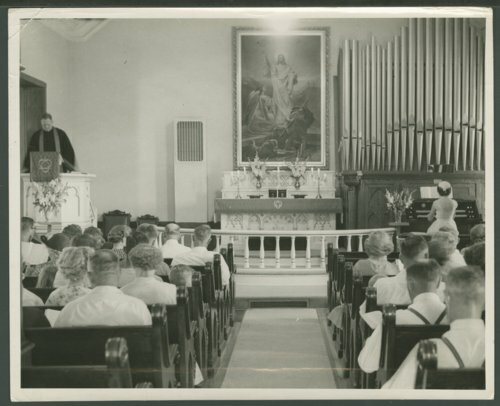 This interior view shows the altar, the pulpit, a pipe organ and organist, and the congregation.